What a fantastic show! We had a GREAT time cheering the guys one and getting pics afterward. The kids and adults all loved this. Awesome time at the lumberjack show. Awesome time at the lumberjack show. So well done. It was also awesome to see the totem poles at Totem Bight State Park!!! We all had a great time at the Lumberjack show. Although Ketchikan is rainiest town in North America we did not get rained on during our time in port, The Lumberjack Show is presented daily rain or shine and we enjoyed it immensely. A great introduction to the Alaskan spirit. Fun experience. Great for kids. It&apos;s a little cheesy but a lot of fun for the family! Have seen this four times on past cruises. Have seen this four times on past cruises. Never disappoints! A fun hour to get you in the Alaska mindset. Somewhat chaotic organization of queues through the souvenier shop?! Somewhat chaotic organization of queues through the souvenier shop?! but once seated in cold benches, lots of wholesome fun watching the lumber jacks rolling logs. Overall, the lumberjack show was fun and entertaining. Overall, the lumberjack show was fun and entertaining. The jokes were a little corny, but that&apos;s to be expected. It&apos;s a nice activity if you&apos;re going to be in Ketchikan for the day. This is a great show for all ages. This is a great show for all ages. Lots of fun. Can;t be beat. 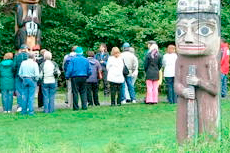 Must see in Ketchikan. It rains quite a bit in Ketchikan and there is covered seating with heaters taking any chill off. Show is funny and full of real competitive lumberjacks. It was entertaining. Got a little bit thick on the not so funny comedy/banter at the end, but overall, a good show. Nice display of skills. KETCHIKAN: This was another small population and port. I really looked forward to this! I really looked forward to this! It was amazing again!!!!! So wonderful and fun to watch. Everyone laughed and had a great time! I highly recommend to see this show, you will for sure not regret it! Pretty usual kind of show entertainment, athletic guys. Pretty usual kind of show entertainment, athletic guys. I would like more historical and practical information on lumberjacks, though. Fun show. We started at George Inlet Lodge with delicious dungenous crab and then saw the lumberjack show. FUN!! Was very entertaining! Totally scripted and all that but was still humorous and a great time! We have enjoyed this 2or 3 times before. We have enjoyed this 2or 3 times before. We still enjoyed it! Very funny introduction to contests. Very funny introduction to contests. We live in Oregon and see the real thing, so mostly there for the show. The audience was divided into 2 teams. The audience was divided into 2 teams. One for the United States and one for Canada. Each side had fun cheering on their team. It was fun cheering pn our team of Lumberjacks even though we did not win. It was fun cheering pn our team of Lumberjacks even though we did not win. Noone to give direction to the Lumberjack Show but the show was great!!! I would have never booked this on my own but auntie and uncle wanted to go. I would have never booked this on my own but auntie and uncle wanted to go. It turned out to be a great entertaining show!